YHA Snowdon Llanberis i Caernarfon, Wales: Bestill nå! Originally an old quarrymasters house YHA Snowdon Llanberis Hostel has stunning views of Snowdon Summit, the surrounding mountains and Padarn Lake and Country Park. YHA Snowdon Llanberis provides an excellent base for individuals, familes and groups wanting to explore Snowdonia. We are open all year round, so start planning your winter walking weekend in Snowdonia. We offer cooked breakfasts, a packed lunch and evening meals. In addition our bar serves local Conwy Ale - all you need after a challenging day on the mountain. If you're tackling Snowdon, Llanberis Path, the easiest route up Snowdon starts nearby. 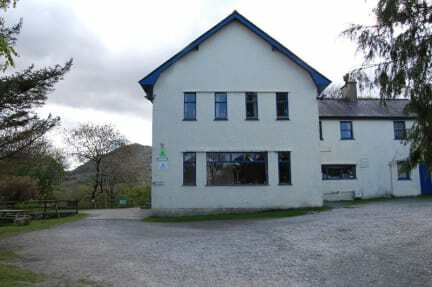 Mountain bikers, climbers and walkers are spoilt for choice at this picturesque hostel. Follow trails to nearby hills, valleys, forests and waterfalls. Llyn Padarn offers fishing, canoeing, windsurfing and sailing, or take the family pony trekking. For a more liesurely day, choose from eight nearby Blue Flag beaches. Unfortunately, none of our bedrooms or washrooms is accessible to modern standards.